After Ranveer Singh and Deepika Padukone, now Ranbir Kapoor and Alia Bhatt is the new B-Town couple. After DeepVeer, it is only Ranbir and Alia those are setting the couple goals. The actors will be soon seen in Ayan Mukerji's Brahamastra and while the shooting the film they fell for each other. Recently, Ranbir Kapoor won the Best Actor award in Zee Cine Awards for his performance in Sanju. Ranbir received the trophy from his love Alia Bhatt on the stage. Alia announced the award by saying it goes to my all-time favourite, Ranbir Kapoor. 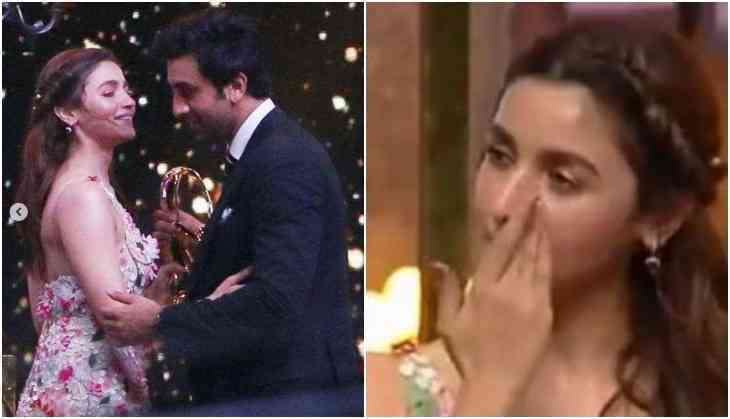 Ranbir Kapoor who came to receive the award hugged Alia Bhatt and while giving the speech he dedicated the award to his two very special people. Actually, Ranbir dedicated the award to his parents Rishi Kapoor and Neetu Kapoor. Let us tell you that Rishi and Neetu both are in New York for the treatment of Rishi Kapoor. While dedicating the award to his father Ranbir said, "I've often heard when you come into some kind of crossroads in life you can really tell who you are as a person. He speaks to me about his insecurity, that when he gets back, will he get to work in the movies, will people offer him films, will he be able to act in movies and that kind of inspiration and passion and madness is what brings all this to perspective." Another side he also dedicated the award to his mother Neetu Kapoor and says that she always gives love to him and that's what exactly matters. When Ranbir was talking about his parents one could easily see Alia who was standing next to Ranbir wiping off her tears.